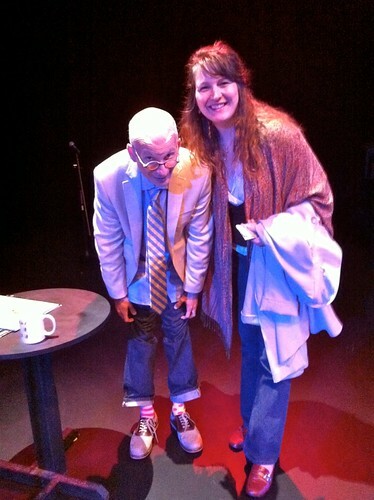 Seth Godin & me, Lee-Anne Ragan, post Seattle talk (check out his Little Miss Matched socks). How dare you waste the revolution! says Seth Godin, who is nothing if not evocative and provocative. At a recent event he gave in Seattle I tuned into his thoughts on forward motion. It’s not about finding the right answer, we need to keep moving forward for how to ‘be’ in this revolution, this wave upon wave of momentous change. 1. Many of us are oriented to look for problems. There’s a whole other universe in looking for opportunities. When it comes to training and development this is gold. When participants are receptive opportunity strikes. Creating receptivity, through paying attention to access and inclusion issues, is a large part of training and development. 2. Factories are about doing what you did yesterday only a little faster and a little cheaper. Factories aren’t made for learning. Mass approaches (think 800 students in an undergrad class) aren’t about learning, they’re about the commodification of education. Great training and development is an art. A customized, one of a kind art. 3. What was once scarce is now abundant and what was once abundant is now scarce. Attention is the new scarcity. Getting attention is tough. Especially when being open to learning means being vulnerable (for to learn is to be vulnerable). Great training and development makes getting attention look easy. And a good chunk of getting attention is paying attention. 4. It’s not about finding strangers it’s about finding and serving your tribe. The goal for musicians is not to find new listeners but rather to create new music for listeners. Like 12 year old girls who want funky socks – a.k.a. Little Miss Matched who sell mismatched socks. Check out their goods on Seth’s feet above. Find and serve your training and development tribe. 5. Revolutions don’t bring maps with them, you have to draw your own map. If you say failure is not an option what you’re really saying is success is not an option. Sometimes the map will be wrong. Sometimes we’ll blow it in our trainings. How we react to mistakes, ours and others, says volumes about our map making skills and our attitude towards learning. 6. In the age of massive amounts of free content, people will continue to pay. People pay: to get to the front of the line, for concierge services, for status, for connection and to get inside the (finite) circle. How can you be a concierge of learning? 7. Only put one number on the whiteboard. Amazon’s key measurement is the number of paying customers. People pay attention and alignment is created when the number is clear, simple and known. How do you measure your training and development success? My mind continues to reel with possibilities and ideas. I know I need to keep that forward motion, and take it one day at a time. In the words of Fivacious, who opened the event, one day at a time I’m gonna change my world…. Hi Travis- it was an honour to be a part of your tribe. What a way to open the event. So memorable and moving. I encourage folks to check out Travis’ youtube channel (see link in his comment) and his facebook page (link is in the post) for his group Fivacious. They are truly something.